Register.it Review 2019: Is Register.it a Good Hosting? Register.It is a premier Italian web hosting service that offers excellent value for both Windows and Linux-based hosting. With Elastic Hosting, you never have to worry about your site being shut down due to bumping against plan limitations. 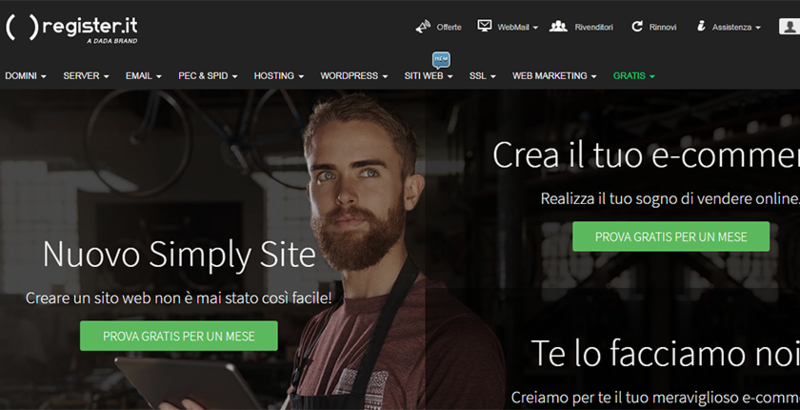 Register.It has been offering online hosting services to Italy for 20 years. They are a subsidiary of the Dada Group and have hosted over 650,000 websites on their platform. Their shared hosting services offer tremendous value with options for both Linux and Windows hosting that’s suitable for all types of websites. Multiplatform – Program in ASP, ASP.net, PHP, Python, Perl, and others. Clustered Architecture – Sites are hosted on redundant and balanced clusters, meaning your site is always available. Application Isolation – Applications run separately from others for greater security. Full Trust Support – Need Full Trust to run certain code on your site? You have it with Windows hosting. Standard cPanel Access – One of the easiest ways to build a site on a Linux platform. Register.It offers the Softaculous auto-installer so you can install WordPress, Drupal, and other CRM software to quickly set up your site. Note that a drag and drop builder isn’t available, so this isn’t ideal for beginners. This platform is more suitable for those with more experience in website coding. These plans offer some robust features that include a ton of storage and the ability to host multiple domains. They also come with free SSL certificates for all of your sites. You can consider that $30 or more will be saved on each website. The large database size makes this provider ideal for those needing large databases, such as for product or customer databases. One thing I really like about this provider is that they offer “Elastic Hosting.” With Elastic Hosting, you get a temporary free upgrade to the next highest plan if you are bumping up against the limits of your current hosting plan. This is a free 14-day upgrade. Granted, most personal and small business sites won’t have this problem, but larger E-commerce sites will appreciate this feature. Register.It offers solid customer support options with phone, live chat, and email support. You can also open a ticket from your cPanel. The one downside to support is that it is only offered from 9 am to 6 pm in the U.K. It would be better if they provided 24-7 support, even if it was just 24-7 chat support. Register.It offers plans with features that should be more than enough to handle anything you can create. However, if your site grows faster than your hosting, Elastic Hosting has you covered with free temporary plan upgrades. Wondering how Register.it stacks up against other Web Hosting companies? Enter any other Web Hosting company and we will give you a side-by-side comparison.